Age one. Maybe the best hairdo. 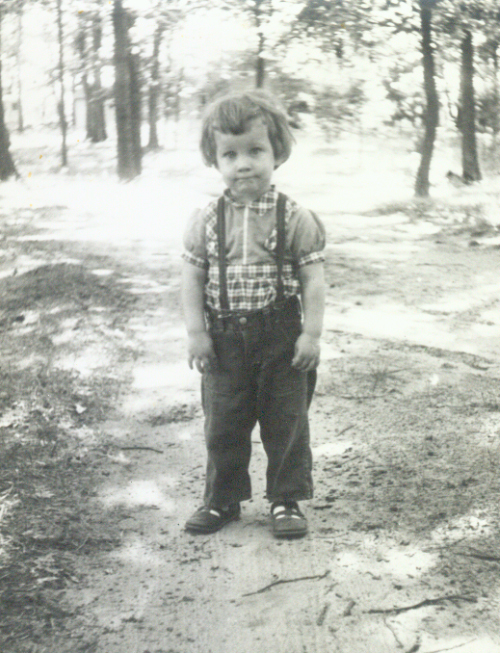 Age two. Beginning to develop my own fashion sense. I was born in Bay City, Michigan, and attended Immanuel Lutheran Elementary School and Bay City Central High School. After two years at Western Michigan University Honors College, I left school temporarily to serve with VISTA (Volunteers In Service To America) in Cabin Creek, West Virginia. There I worked with Cabin Creek Quilts, a cooperative of 150 low-income quilters. Following 15 months of volunteer service and a year of work as an editor, I returned to college, this time at West Virginia University. I received my B.A. in English from WVU in 1975 and a master's degree in Humanities from Marshall University in 2000. Self-employed as a writer and designer since 1975, I formed Mother Wit Writing and Design in 1983. My creative studio has earned numerous honors, including West Virginia Communicators Best of Show award and several First Place awards from the National Federation of Press Women. My stories and poems have been published by the PEN Syndicated Fiction Project, Redbook, Embers, Kestrel, Arts & Letters, Antietam Review, Passager, Carolina Quarterly, The Sun, and many other periodicals. My songs have been featured on Public Radio International's Mountain Stage and The Folk Sampler, and I have produced two albums of original songs, Fabulous Realities (1991) and Going Over Home (2001). My writing has earned two Individual Artist Fellowships from the West Virginia Commission on the Arts, as well as a residency fellowship from the Helene Wurlitzer Foundation of Taos, New Mexico. I live and work in Charleston, West Virginia.